We’re threw an event last March and we’d like you to learn from it! 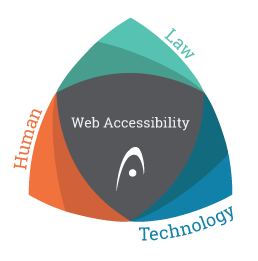 The event, “The human, design and legal implications of web accessibility” covered some of the common questions about web accessibility. What does we b accessibility really mean? What’s it like to use a screen reader to browse the web? How should a nonprofit or business approach web accessibility? What are the risks for my organization if our site is not accessible? First, we aimed for a better understanding of web accessibility in general. We gained new perspectives on the challenges and frustrations for those who can’t access sites they want to visit. Then we learned about concrete steps you can take to insure that your site will work for everyone. Already convinced? Register for the event here. While access to websites for everyone has always been critical, we’ve noticed that more than ever before, nonprofits and businesses have questions about what accessibility means and are now more committed to having a web presence that can be accessed and enjoyed by all. “The Human, Design and Legal Implications of Web Accessibility,” event featured three unique perspectives. This included full-time assistive technology instructor from Vision Loss Resources, accessibility experts from Accessible360 and two employment attorneys specializing in this area from Fafinski, Mark & Johnson. These two lawyers have experience handling web accessibility litigation and how it pertains to employment law and nonprofits.